This is an extract from an article written for Ríocht na Midhe, the journal of the Meath Archaeological and Historical Society and reproduced with their kind permission. To read the article in full and get a copy of the society’s journal, become a member by visiting the website at the above link. Reference: Flood, K. ‘Taming the wilderness’: A history of Girley Bog 1606–2016. Ríocht na Midhe, XXIX (2018) 73-115. As this passage from Feehan & O’Donovan’s classic book “The Bogs of Ireland” indicates, the history of Irish bogs is inextricably linked with human history, and the story of Girley Bog is no different, having been influenced by political, social, and economic concerns. The colonial conquests of the sixteenth and seventeenth centuries were followed in the eighteenth century by efforts to drain, develop, and improve land, especially marginal land such as bogs. In the nineteenth and twentieth centuries, bogs were increasingly exploited as a cheap source of fuel, and half of Ireland’s raised bogs (primarily located in the midlands region) disappeared between 1814 and 1946 . The increasing awareness of the many values associated with peatlands aside from their use as fuel, has led to efforts to conserve, manage and restore these sites to protect their value for both the species of plants and animals that live there, and local communities who enjoy the beauty and recreational value of these landscapes. The name Girley comes from the Irish word Greallach or An Grellach, meaning a swamp, bog or mire and raised bogs such as Girley bog developed alongside the human presence in prehistoric Ireland. In Drewstown, one of the townlands bordering Girley Bog, a dolmen and earthworks dating from circa 3500 BC are present, indicating the presence of human settlement around the bog from earliest times . The time period covered in this study begins in the early 1600s when Girley bog first appears as a distinct landscape feature in maps and historical records. The Down Survey of Ireland 1656–1658 was the first ever detailed land survey on a national scale anywhere in the world, and was carried out by Sir. William Petty. The survey aimed to measure all the land to be forfeited by the Catholic Irish to facilitate its redistribution to merchant adventurers and Cromwellian soldiers. There were 6 estates around Girley Bog in the townlands of Cloncat, Scurlockstown, Ethelstown, Chamberlainstown, Girley and Drewstown Great, and each estate owned a section of the bog. The size of Girley Bog is given as 334.2:32 (334 acres, 2 roods, 32 perches) at this time, which would be equivalent to approximately 534 acres today . In the 19th century, mapping became imperative with the need to administer and supervise British state interests in Ireland. Ireland’s history as a British colonial conquest wielded enormous influence on land tenure and ownership, and the social fabric of Ireland revealed immense inequalities between the landed gentry and their tenants. Bogs were frequently the only land that tenants and poorer classes had access to and were used for habitation, growing crops, and for fuel. The county of Meath is observed to have “a more marked disparity than … any other part of Ireland”. Griffith’s Valuation was carried out in the years 1846-64 and the Meath valuations were completed in 1855. The valuations and accompanying maps for the townlands around Girley Bog reveal how much of the bog was owned by each landowner. It is also possible to gauge the type of dwelling on Girley Bog by examining the A.R.V. – the annual rateable valuation of the houses listed. At the bottom of the scale are houses taxed at 8, 10, and 15 shillings . These are one and two room mud-cabins, with a thatch or turf roof, which are shown to be present on all of the townlands around Girley Bog. Their presence in the records of Griffith’s valuation is the only evidence left of this type of dwelling, as nothing remains of them on the landscape today. 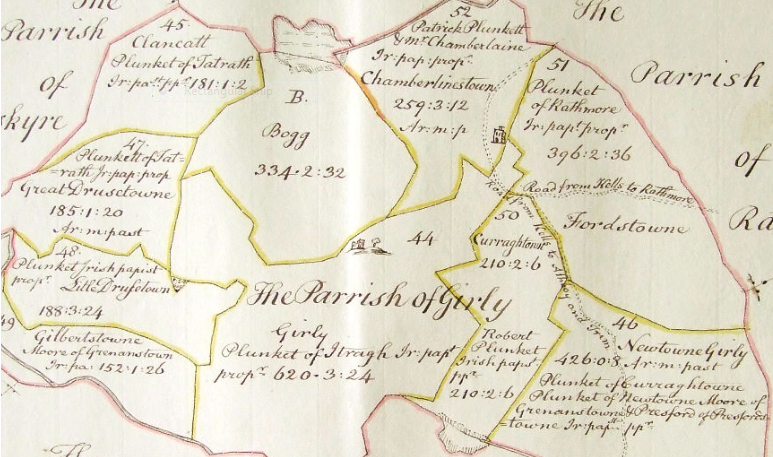 This process of land reclamation by tenants and small farmers was documented, along with other aspects of the rural economy in County Meath, in the Dublin Society’s ‘Statistical Survey of the County of Meath’ in 1802 . This survey of the landscape of Meath was written in the aftermath of the 1798 rebellion and in the context of an increase in agricultural activity due to the Napoleonic Wars. County Meath had very productive agricultural land, mostly owned by a Protestant elite, while labouring classes struggled to pay for fuel, rent, and obligatory tithes owed to the Anglican Church. Many survived on potatoes and whatever crops they could grow on common land such as bogs, and likely made very little out of these crops, despite the following pronouncement: ‘Many small patches of bog are reclaimed by poor persons, living on their edges, who, by burning and draining, make considerable profit from the sale of cabbages. Potatoes and rye are often grown with some success’ . In the years prior to the Famine, poverty was evident in County Meath, despite the county having rich fertile land and many wealthy landowners. The Ordnance Survey Field Name Books for Chamberlainstown describe how the bog ‘contains numerous inhabitants settled chiefly along the edge of the bog’ . Many of these inhabitants lived in mud cabins or small cottages. The presence of mud cabins on bogs in the Barony of Kells Upper and Lower is confirmed in the Reports of the Irish Poor Law Commissioners 1836, although the names of specific bogs are not given. Economic records show that one-third of Meath’s population in 1851 lived in mud cabins, and the population of Meath doubled from 90,000 to 180,000 in the 60 years before the Famine , so there was pressure on land and a general scarcity of fuel. This suggests that people were living on the edge of the few bogs there were in County Meath: ‘The neighbourhood of bogs is always thickly inhabited on account of the facility of procuring fuel and also of building cabins there without molestation. Vagrants also flock to bogs for the sake of the fuel which is plentiful there’ . Writing about the people who lived in these mud cabins, Connell described them as ‘lost generations whose cabins and potato plots are gone and little written history about them survived. There were more surviving drawings of fat cattle than either mud cabins or their inhabitants’ . Despite the poverty which was evident in County Meath at this time, life went on as normal for many members of the landed gentry. Ethelstown bog forms part of what is now known as Girley Bog, and was owned by the Nicholson estate at Balrath, which was located approximately four miles from Girley Bog. A detailed log was kept of the shooting and hunting activities at Ethelstown and other locations owned by the estate around Meath. The Balrath Estate shooting book  contains entries from 1850 to 1880 and provides information on bird and mammal species present on Ethelstown Bog at that time. The following bird species were recorded as being shot at Ethelstown: Red Grouse, Partridge, Quail, Snipe, Woodcock, Rail, Teal and Plover. Of these species, only Snipe and Woodcock are still present at Girley Bog. This study reveals the legacy of historic events on the ecology and hydrology of Girley bog, following centuries of reclamation and drainage, as well as the social history of the bog, much of which has disappeared from the physical landscape. It is only through examining documentary evidence that some of these hidden histories may be revealed. Duffy uses the metaphor of “landscape as palimpsest”, where “the legacies from different times in the past accumulate to form the present day landscape” . This idea of landscapes displaying layer upon layer of change is particularly relevant for bogs, where successive layers of vegetation build up over time and elements of Ireland’s past are revealed through archaeological finds such as bog bodies and butter. These legacies from different times also remind us that future landscapes will, in turn, be legacies of current policies and processes, and that contemporary actions will become another historical influence on the landscape . It is hoped that current management of Girley Bog for conservation & recreation by state agencies and the local community, will lead to more active raised bog and peat formation, reversing the trend of bog shrinkage seen over the last 400 years. John Feehan & Grace O’Donovan, The Bogs of Ireland, (UCD, 1996). John Feehan & Sadhabh McIlveen, ‘The changing use of raised bogs’ in, Atlas of the Irish rural landscape, eds. F. H. A Aalen, Kevin Whelan and Matthew Stout (Toronto, 1997). R.F.G. Adams, “Drewstown and Girley. Neolithic burial chamber to Christian abbey” in Riocht na Midhe, vol.1, no. 4 (1958), pp 54-60. The Down Survey is in Irish acres and the English acre is constant up to today. There are 1.61 Irish Plantation acres to 1 English Statute acre. There are four roods in an English acre and forty perches in one rood. Fiona Fitzsimons, An expert guide to the Griffith’s Valuation, Blog. Robert Thompson, Statistical survey of County Meath, (Dublin, 1802). Thompson, Statistical survey of County Meath, (Dublin, 1802), p. 262. National Archives of Ireland, Ordnance Survey Field Name Book: Dulane, Girley, Teltown, County Meath. Ref: OS/88/Meath/35, (1835-1836). Peter Connell, “Navan Historical Society – Fat Cattle and Mud Cabins in Pre Famine Meath” in http://www.navanhistory.ie/index.php?page=lost-generations. Poor Inquiry Ireland, Reports of the Irish Poor Law Commissioners, (Oxford University, 1836), p. 50. Meath County Library Archives, Balrath Estate Shooting Book, (1850-1880). Duffy, Exploring the history and heritage of Irish landscapes, p. 11. Marcucci ‘Landscape history as a planning tool’ in Landscape and urban planning (2000).